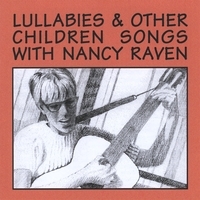 Nancy''s voice with guitar accompaniment singing traditional folk songs for children from the Early American genre. Nancy Raven is a mother. She plays the guitar and sings these songs because this is the way she speaks best to children. These songs are not meant for the whole wide world; they are meant for children -- and their mothers. Nancy's songs give a special lift to the mother-child day. As a mother at home with diapers, dishes, and drying clothes, and as a participating mother in a co-op nursery in Long Beach, and then as a nursery school teacher, Nancy learned to bring the gift of special songs to special moments: The gently recognizing Mary Wore a Red Dress to the awkward moments of shyness; the funny old Cross-eyed Gopher or Snake Baked a Hoecake or the stamping, whirling Old Joe Clarke to the tense or angry times; Up in a Balloon for the earthbound dull hours, and the lullabies. These lullabies wrap up her child, and yours, in a light, warm, many-colored blanket of song before sleep. Nancy never wants to sing alone. She wants to sing with children and mothers. You'll want to sing, too. Animal and people songs are always a delight for our children because their imaginations are vivid, and they can accept the silly, funny, and strange people we find in song as almost real. Life gets serious soon enough. We should keep the children's hearts light with songs as long as possible. I encourage you and the children who sing with you to change names, animals, and situations in the songs as much as necessary, for this is folksinging at its best. Many of the songs in this recording are excellent for dramatization. Let one or more boys, for instance, play the part of the Little Black Bull and go through the antics of the song. Old Bosun is another marvelous song with dramatic possibilities. It's fun to plant an apple tree (played by a child) and watch it grow and dump the apples on the ground. Usually it helps to know your children before dramatizing a song; the group will tend to be shy if they are new to you. Sing the songs and learn them well -- then start the dramatization. Don't be discouraged if you encounter shyness; the most effective way to overcome it is to get into the dramatization yourself, and disappear as gradually as possible when you feel them taking hold. Above all, relax -- and enjoy yourself!